Wondering how I traveled in Kyrgyzstan and discovered all these amazing places? I did it with a small group tour organized by the blogger Wandering Earl. In this post I give you a detailed and independent review of the tour: itinerary, guide, transportation, accomodation and food. And if you have any other question, leave a comment below the article. First of all I selected this tour myself and paid entirely for it. This review is fully independent. 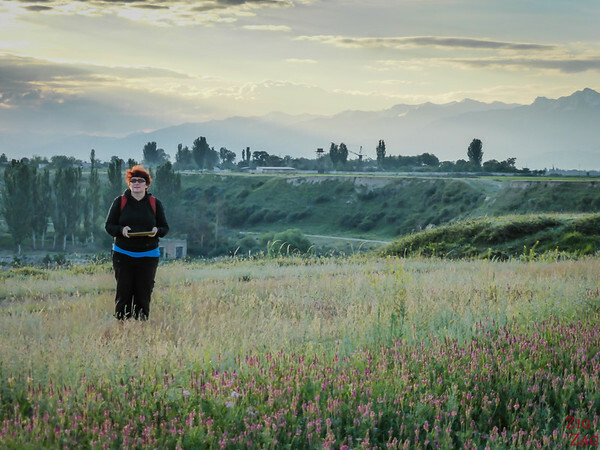 How I came to chose this tour: I had been following Earl's blog for quite a while and had been intrigued the year before when he shared about his visit to Kyrgyzstan. In January, he announced his tours for the eyar and I saw that the country was on it. I had a look at the itinerary which sounded wonderful. Before deciding to book it, I had a look at what other small group tours existed for this country. ​It seemed that at the time most tours covered many countries and did not explore it for that long. Therefore it seemed like a great opportunity and I signed up. During those 2 weeks, we covered a lot of the country. As most of the country is above 3000m high we spent a lot of time in the bus. However the scenery was amazing so I did not find it an issue. There were a few things that were not to my taste: too much time in Bishkek and not enough at Song-Kul. But it was the first time he was running the tour and I am sure it will improve next time. Generally we covered a lot of the country and got a good overview of the different landscapes​ and people. If you want to have a look at what we saw in more details, you can check the Kyrgyzstan Destination Guide with detailed posts and many pictures or have a look at my video: Landscapes of Kyrgyzstan. For this tour Earl himself was not available to lead it. So our tour guide was Masha Preslitskaya. She is Russian and is a full time tour guide with many companies as well as her own (It's journey time) all around Asia, Eastern Europe and Middle East. She does not look like she is working. She seems to have as much fun as we have. She is very good at quickly understanding what everyone likes and adpating everything so that we all get something during the day. For example stopping at abandonned soviet buildings for a guy in the group, beautiful landscape stops for me to photograph... Even foodwise she remembered what we liked and got us what we needed. For the small group we were, we had a comfortable minibus. Everyone had plenty of space. 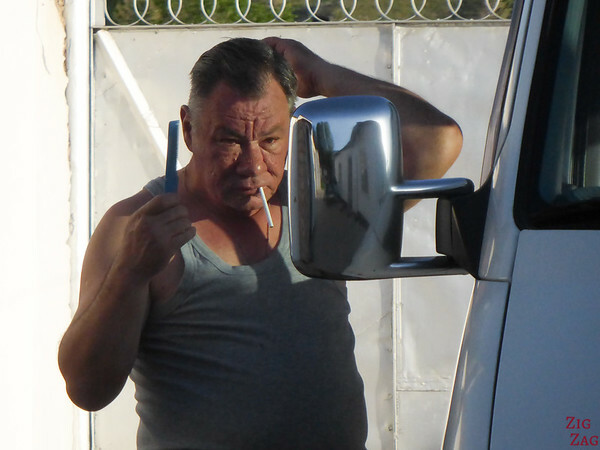 The driver was Igor and the bus is his own vehicule so he takes good care of it. I was sitting in the front so I had the best​ view of all. The other people on the tour had few reservations. There were curtains that limited the view outside of the window and when the road was bumpy there was nothing to hold on. However we all agreed that Igor was an excellent driver and I personnaly felt very safe during the whole trip​. 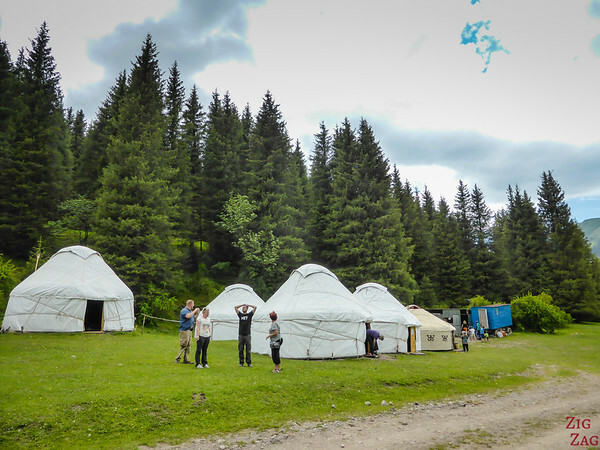 We stayed in a variety of accomodations: hotel, guesthouses and yurts. We enjoyed the charm of everyone of them. Only one had a toilet that was not very enjoyable, but considering the state of the country, this is not surprising. In Bishkek the hotel was not central (but not far either) and the rooms were great. When we returned at the end, they had opened the pool and it was very enjoyable. In Karakol​, it was the place with the least character but the owners were very friendly and we were away most of the day anyway. In Tamga we stayed at Tamara's guesthouse, made famous by Earl through this post.​ She is quite a character! It was very enjoyable. In the isolated town of Kazerman we had a basic guesthouse with an interesting outside area to relax and eat. 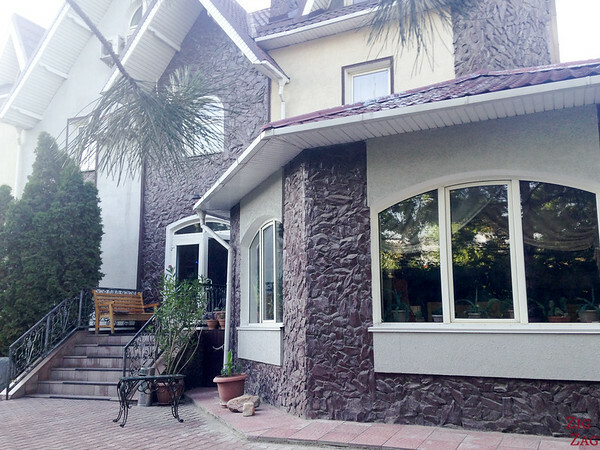 In Arslanbob, the guesthouse was beautiful with a garden and a terrace for our meals. We spent 2 nights in yurts. In The valley of flower (Jeti-Oguz), to my opinion, we had the best location of all the yurts. Isolated and next to the river. We had fun with the family. In Song-Kul, we could not find our yurt (they are nomads after all), so we stayed at a place close to the lake :-), my favorite spot in Kyrgyzstan. Most of us did not know what to expect and we were pleasantly surprised. I will dedicate a post to food. 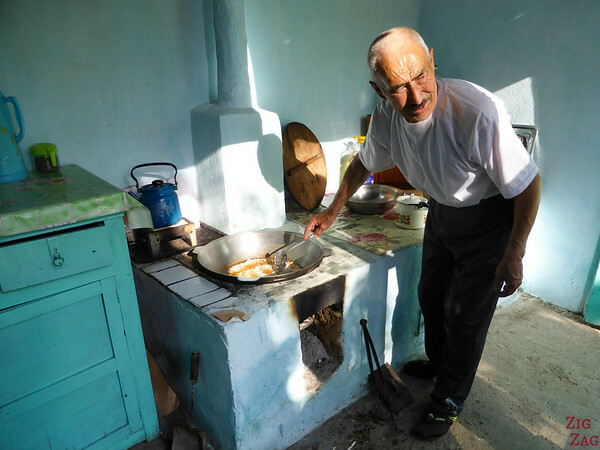 During this tour, some of the meals were included and the locals cooked some typical dishes for us that were excellent. The rest of the time, Masha found a place for us and we were always satisfied. As you can see I had a fantastic experience with my Wandering Earl Tour. I especially love that he keeps the group size under 10. It would have been great to have you there with us. Hopefully we can meet another time! Sorry but I am not a travel agency. I am a blogger and this is my review specific to the one small group tour I did in Kyrgyzstan. You need to contact travel agencies to see if they have vehicles that would satisfy you. In the minibus we used, it would not have been possible to comfortably sit 2 people in the front. I’ve really enjoyed reading your articles about Kyrgyzstan. The country had never been on my radar before, but after seeing your wonderful pictures, I feel that I need to go ASAP! I’ve never been on an organised tour and I’m a bit reluctant to do so as I like exploring on my own (or with a friend or two) and the freedom that comes with it. How realistic do you think it would be to attempt to do something similar to the tour you did, but independently? With regards to transportation, directions, interaction with locals, dealing with small day-to-day things, etc. I understand that it depends of how well-seasoned one is as a traveller, and also that you haven’t travelled the country solo yourself, but I would still love to hear your thoughts on this. Thanks for your comment. I am glad you are enjoying my articles. I understand your point about tours. I do like wandering on my own. It is a tradeoff. This is why I always book small group tours. More freedom than the big ones. With this particular tour and guide, I actually had a lot of freedom to walk around the many places. For example I did Skazka twice, the other went to the beach the first time. At each place we could stay with Masha or listen to her comments and wander on our own. 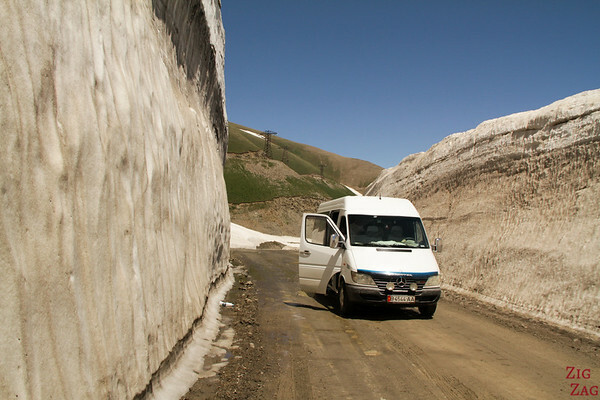 Traveling in Kyrgyzstan can be done on your own. We have met several people along the way doing just that. However, considering the transportation limitations, you need more time or skim the itinerary. You won’t be able to do that same thing in the same timeframe. I think we met 2 people who were doing something similar to us the other way around. They were using hitchhiking, busses, horses etc. They were traveling for a month. Thank your for the reply Claire. It’s true that a small tour group would be quite different. I think I might go this way, because the thought of 2 weeks of solo driving in the moutains without knowing the local language is quite daunting for me. Somehow not knowing the language when visiting cities doesn’t scare me at all, but it’s another thing when on a more “isolated” trip. Im loving your blog and your posts about Kyrgyzstan, very informative and clear. I wonder if you know how to contact Masha. 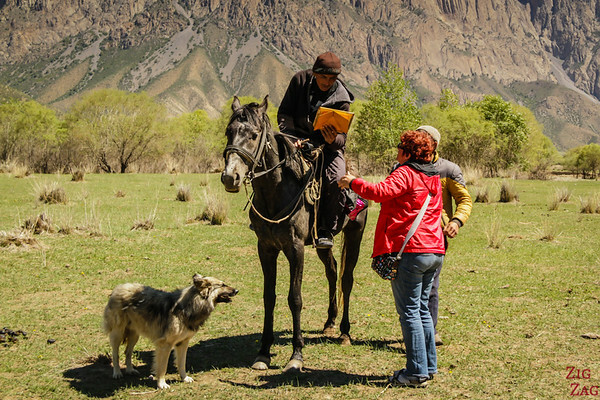 She really sounds like a great guide, and I would be interested in joining a trip in Kyrgyzstan organized by her. Thank you for your posts, I await your answer! Sorry, Masha is currently taking a break from leading tours. It can be exhausting to constantly be on the road.